"For a fellow who has as much talent with a camera as Orson Welles and whose powers of pictorial invention are as fluid and as forcible as his, this gentleman certainly has a strange way of marring his films with sloppiness which he seems to assume that his dazzling exhibitions of skill will camouflage. 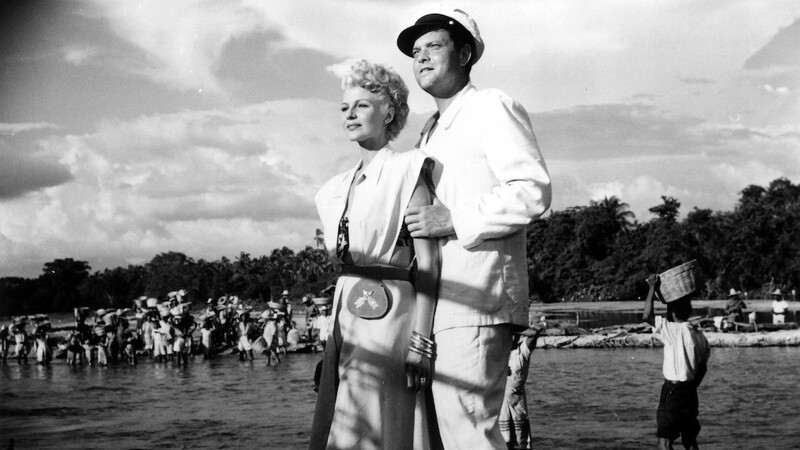 Take "The Lady From Shanghai," for instance, which came to Loew's Criterion yesterday: it could have been a terrific piece of melodramatic romance. For the idea, at least, is a corker and the Wellesian ability to direct a good cast against fascinating backgrounds has never been better displayed. It's the story of a roving merchant seaman who falls in with some over-rich worldlings and who almost becomes the innocent victim of their murderous hates and jealousies. And for its sheer visual modeling of burning passions in faces, forms and attitudes, galvanized within picturesque surroundings, it might almost match "Citizen Kane." The build-up, for instance of the tensions among four people, in particular, aboard a yacht sailing from New York to San Francisco is tremendously captivating. In the group are the mesmerized sailor, his enchantress who is a sleek, seductive thing, her husband who is a famous criminal lawyer and his partner, a wild-eyed maniac. And in the subtle suggestion of corruption, of selfishness and violence in this group, intermingled with haunting wisps of pathos, Mr. Welles could not have done a better job. And he couldn't have picked better actors—for three of the roles, anyhow. Everett Sloane is electrified with sharpness and malignance as the lawyer and husband, and Glenn Anders is exquisitely disturbing as the indefinite lunatic. Even Rita Hayworth, who is the Circe in the swinish company, is entirely adequate to the requirement of looking ravishing and acting vague. But no sooner has Mr. Welles, director, deposited this supercharged group in literal San Francisco after a particularlý vivid voyage up the Mexican Coast than Mr. Welles, the author, goes sloppy and leaves him in the lurch. For the protean gentleman's arrangement of triple-cross murder plot designed to entrap the sailor is a thoroughly confused and baffling thing. Tension is recklessly permitted to drain off in a sieve of tangled plot and in a lengthy court-room argument which has little save a few visual stunts. As producer of the picture, Mr. Welles might better have fired himself—as author, that is—and hired somebody to give Mr. Welles, director, a better script. Due to the Halloween Parade in Manhattan, tickets to the 9:55pm showtime on Wed Oct 31 will only be available at our box office, not online.